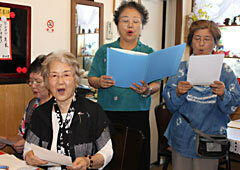 On May 27, at Shuri in Naha, Teruko Omine (second from left) and the members of the choral group Tanpopo sing the song Himeyuri. A song that 86-year-old Naha resident Teruko Omine wrote as a memorial to her friends who died during the Battle of Okinawa as Himeyuri nurse-aides is arousing people’s sympathy. Omine attended the former Okinawa Daiichi Women’s High School, which was located at Asato district in Mawashi Village (now Naha), but avoided the fighting in Okinawa because she went to Tokyo in April 1944 to study. After returning to Okinawa, Omine has lived her life cherishing the memories of her deceased friends. The stories that she heard from people who survived the battle had a strong impression on her. “I hate war. If the war hadn’t happened, they would have had led happy lives with families, eventually being surrounded by grandchildren and great-grandchildren,” Omine said, fighting back tears of emotion. Omine wrote the song titled Himeyuri about two years ago, singing it to the tune of the famous Japanese song Hamabe no Uta (The Song of the Seashore). Toshiko Taira, the 80-year-old leader of the choral group Tanpopo that Omine belongs to, composed some original music for Himeyuri. In addition to Tanpopo, this song has become a popular piece for another two groups in which Taira gives singing lessons. The song starts with the phrase, “Fragrant lily blooming bravely in the embrace of the school garden in Asato.” It continues on to a verse about the girls in the Himeyuri Student Corps who received a kominka education that stressed the raising of citizens as loyal subjects believing in victory and willing to give their lives for their country and for the Emperor. In the last verse, as they think about their old friends who lost their lives at the southern tip of Okinawa’s main island, the survivors vow to become storytellers who convey love and an anti-war message to the world. “Survival during the war was just a matter of the luck of the draw. Many who came through it have a sense of guilt and unease about friends who died,” Omine said. Some of the choral group members shed tears while humming the song Himeyuri during their practice. “I felt myself trembling when I read the words. The words for the song came into my head in one night. I would like to continue singing this long into the future,” Taira said.